You are on your way to work, you are at work, you are shopping with your family, or on the way to the gym. You are simply going about your daily business, walking the same route along the same streets as you have done for as long as you can remember - but today is different... Today, there has been a major incident and you have just found yourself standing on the edge of it. What do you do if there was a terror attack or major incident? An incident can be over in a number of seconds or minutes; it took five minutes for Mohamed Lahouaiej-Bouhlel to drive the two kilometers along the seafront promenade in Nice, France on the 14th July 2016 (Bastille Day), killing 84 people instantly and injuring 434. The 2017 Westminster attack in London is said to have taken a total of 82 seconds from start to finish, and in that time six people died and fifty more would be injured, many with life changing injuries. In this blog article, Adam Gent goes over the options for Rapid Triage with terrorist incidents in mind. 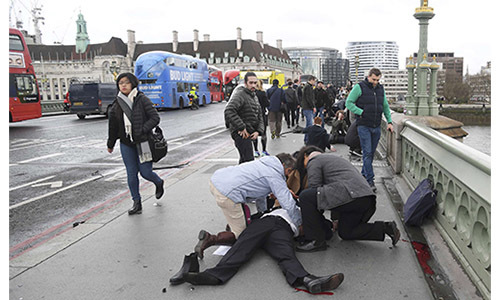 The recent terrorist attacks in European cities such as London or Paris demonstrate great examples of members of the public getting drawn into an incident and needing to administer First Aid to injured members of the public. This really could happen to anyone, anywhere and Adam's advice is a great guide to the decision making process of Rapid Triage. The first thing to bear in mind is that the scale of the incident may not be apparent to you at first glance. You could be dealing with a major incident with tens of casualties, hundreds or just a few, just what you see in front of you. The incident may or not be over, so personal safety must be a major consideration. If you become injured you cannot help other people, and this would make the situation worse. Other people are the next consideration – those who are not injured. Manage them to prevent them from becoming casualties. Utilise them to make your life easier. Existing casualties are the least important factor at this stage; they are already casualties, so prevent the number of casualties increasing. Alert other people to the incident and its danger. Clear access to the incident for emergency services. Manage egress from the incident to allow survivors to evacuate as quickly as possible. Gather first aid resources – first aid kits from cars or nearby shops, or improvised items, such as: spare clothing and packaging materials. Marshall traffic to prevent congestion. Once the area has been made safe, now you have to triage. 1. Casualties are not triaged based on how loud or quiet they are. Someone emotionally traumatised may be laying foetal in the corner, not saying a word, and someone with a femoral bleed may be screaming in agony. 2. Casualties are not triaged based on whether they are conscious, or not. A casualty can be unconscious, but otherwise perfectly healthy (feinting), or they could be fully conscious, but expected to deteriorate and die very quickly. 3. Casualties are not triaged based on their injury. Injuries do not necessarily tell you if a casualty is going to die. A bleeding head wound can look horrific, even though it is essentially superficial. A sucking chest wound or internal head injury can kill a casualty quickly, without producing that much blood. So, if all of these standard rules we have either been taught or assumed are unfounded, how do we prioritise casualties? There are many algorithms used to quickly triage casualties utilised by UK, US and other international healthcare professions. They are tried, tested and effective, but complex; even a seasoned veteran would be expected to resort to their Aide Memoire or Crib Sheet on arrival at a major incident. Anyone who is walking around has either the mental capacity, or physical ability to mobilise themselves. They are by the nature of their abilities, less serious than someone who is not able to do so. These people are your walking wounded. Utilise them, or direct them away from the incident to help. If the casualty appears unconscious, properly check the mouth and clear it if necessary. Then, open their airway by tilting the head (forget about spinal injuries right now; if you don’t have an open airway, you don’t have a casualty). If you are confident they are not breathing, they are dead. Ordinarily, with a single casualty, we would now summon a defibrillator, call the Emergency Services and commence CPR. In a multi-casualty scenario, dead people are not casualties. Help those who are still alive. These are Category 0 casualties – Dead. If they are breathing, are they breathing normally? If they are on the ground, they are in a more serious condition than those who can’t walk, so they are a higher priority than a 3. If they are breathing normally, they are Category 2 casualties – Urgent. If they are not breathing normally, they are Category 1 casualties – Immediate. How someone breathes is one of the most revealing indicators of their state of health, but forget about clinical metrics. Quite simply, does their breathing seem normal? Normal speed, effort and depth? Normal breathing is slow, easy, regular and silent - any change to this indicates a problem. Noisy breathing can indicate an airway problem. Slow, deep heavy breathing can point to a head injury. Fast, weak breathing when someone is cold and pale, indicates blood loss. All of these life-threatening conditions can be present, regardless of whether there is a visible injury, and regardless of whether they are conscious or not. It is vitally important that the Triage Process does not involve treatment (with two exceptions explained below). It is far too easy to get drawn into dealing with the first casualty you come across, at the expense of other casualties. Triage is an objective, emotionless process that is almost ruthless. This is fundamental to allow us to administer the best care to as many casualties as possible, rather than to the few at the expense of the many. Step 1: Take charge – poor communication leads to casualties being missed, or triaged twice. 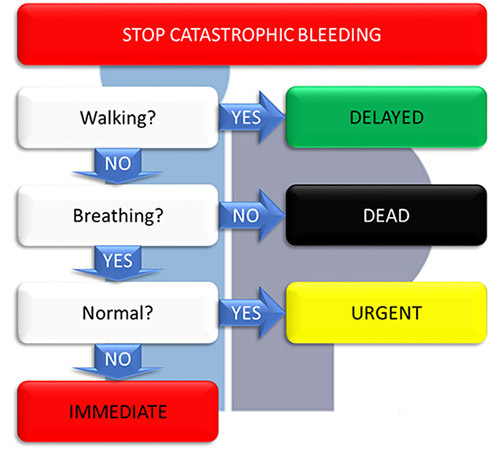 Step 2: Triage everyone – use bystanders and the Category 3 casualties to sit with or tend to Category 1 and 2 casualties, as you identify them. Step 3: Identify all of the Category 1 casualties. These are where your priorities are and where we direct our time and resources. When the emergency services arrive, direct them to these casualties first. Step 4: After you have stabilised the Category 1 casualties, they DO NOT move onto Category 2 casualties – things change so triage everyone again. Category 3 casualties deteriorate and become Category 2, Category 2 casualties become Category 1, and some Category 1 casualties will become Category 0. Place all unconscious casualties on their front, before you move on. If they are unconscious (not walking), but breathing normally they are Category 2. If you leave them on their back, they will very quickly become Category 0, because you failed to protect their airway. A catastrophic haemorrhage can be defined as an ‘immediately life-threatening bleed’ – this is an atrial bleed which is actively pumping. If blood is squirting out of a casualty, they still have lots of blood, and their heart is working well. If blood isn’t actively pumping out, if it has just pooled and not getting any bigger, ignore it - either it isn’t catastrophic (and therefore not time critical), or they are dead. Stop the bleeding with a tourniquet (dedicated or improvised) if the bleeding is on a limb or wound, or use packing if it is abdominal.